Home : Stereogram Images, Games, Video and Software. All Free! Welcome to the World of Hidden 3D Stereograms. This website is dedicated to stereograms, also called autostereograms, amazing optical illusions of three dimensions hidden within two dimensions. Our mission is to collect all information about stereograms in one place and preserve it for future generations. Also, we want to let people, who are not familiar with stereograms, know more about this fascinating art. 2017-02-21 License our Stereogram Artworks - Are you looking for affordable royalty free licenses of our stereogram images? Check out our shutterstock set. Each image comes with answer and viewing instructions. 2017-02-17 Follow us on Instagram - If you are an Instagram user here's a good news for you: we started posting mobile friendly stereograms daily. Facebook users will get cross-posts of the same images as well. Would love to hear your feedback on Instagram and facebook. A stereogram is an optical illusion of stereoscopic depth created from a flat, two-dimensional image or images. At first sight a stereogram looks like an abstract image made of repeatable patterns. But if you look at it in a special way, the hidden 3D picture will magically appear. What you will see is a relief object or objects wrapped with the pattern you can see in the 2D picture. Some stereograms don't have hidden images and consist of several objects placed in rows. When you perceive them, the objects will appear three dimensional, sometimes resting on different levels of depth. Not all stereograms are the same. 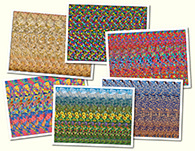 There are different types and styles of stereograms. How to see the stereograms? If you are a person who sometimes has trouble seeing hidden images in stereograms, let us explore together how to view stereograms. Once you can see stereograms well, you'll be able to see stereograms in our galleries, play stereogram games, and even create your own stereograms with hidden pictures. What blocks some people's ability to see stereograms? Most people (with normal vision) are able to see stereoscopic images, however some people with monocular vision, who can only see out of one eye, cannot see hidden stereogram pictures the way most people can. Surprisingly there is a tool on our website which reveals the hidden image or images to people who can't see the hidden stereogram images with normal binocular vision. There are different types of stereograms, but the most popular ones, those with a hidden picture, are made from two images, a depth map of the hidden picture, and some 2D pattern. Special software renders stereograms, by stretching and cutting the pattern based on the given hidden picture. Try our simple online stereogram creation tool - Stereogram Paint. Originally stereograms were known as stereoscopic cards, representing views for each eye. The invention of autostereograms was possible thank to computers. 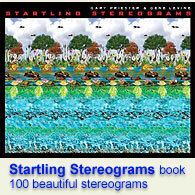 In the 90`s stereograms became a world craze and millions of stereogram books were sold. After the craze calmed down, stereograms became a small niche of stereoscopical art. Check the menu on your left, it allows you to access all main pages such as Theory, Gallery and Games. It has two levels, the Main Menu and Sub-menu. When you click on the main menu item, its sub-items will expand on the sub-menu, or you can just explore our website using the sitemap.